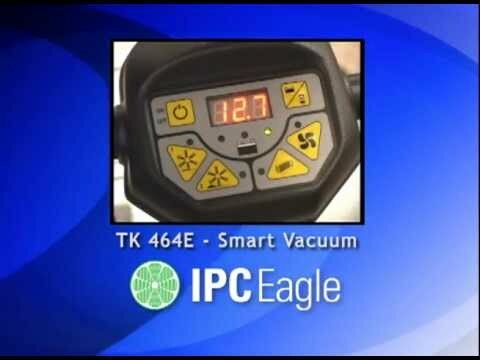 IPC Eagle SmartVac™ 464E Vacuum Sweeper - 24" | Kerr Paper & Supply, Inc.
IPC Eagle SmartVac™ 464E Vacuum Sweeper - 24"
Battery operated up to 2.5 hours. Highly manueverable. Picks up large debris with no worries. Adjustable handle for easy transport and storage. Multi-surface vacuum and sweeper. The brush automatically adjusts to any type of carpet or hand surface floors. Battery operated up to 2.5 hours. Highly manueverable. Picks up large debris with no worries. Adjustable handle for easy transport and storage. Main brush width: 16"; Hopper volume: 1.25 ft3. Maintenance free sealed battery for up to 2.5 hours of continuous cleaning. Ultra quiet at 55 dBa can be used at anytime day or night. Self cleaning filter system provides for optimum vacuum performance. SLS (Self Leveling System) automatically adjusts to any surface. Micro dust filtration to assure clean indoor air. Main brush special "V" shape and long bristle design to assure deep cleaning. Dust filter replacement without tools. Main brush replacement without tools. Side brush replacement without tools. Easy to use two work programs and a display with self-diagnostic data, battery charge status, and hour meter. The brush automatically adjusts to any type of carpet or hard surface floor. Micro dust filtration. Filter with incorporated rubber gasket for maximum control of dust. Pre-filter also equipped to catch large fibers. Designed to assure minimum noise levels. Low noise vacuum fan. Productivity: at max speed 31,000 sq ft.